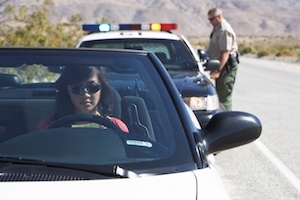 Red light tickets have many similarities to stop sign tickets. When facing a red light you must stop at the proper location just like with a stop sign. That means at the stop line if there is one, otherwise the nearest point of a cross walk if there is one, otherwise the nearest point where you can see approaching traffic. You also have to come to a complete stop and cannot do a “California” roll on a right turn. There are actually two different types of red light tickets – the ticket when you are stopped at the scene and are given a ticket by the officer and the ticket you receive in the mail from a camera. If you get a ticket from the officer, then that type of red light violation is a moving violation and it will go on your driving record if found committed. Instead, if you receive the ticket in the mail due to a camera seeing your car not stopping, then that is treated like a parking ticket. While the government knows who the car is registered to, it does not know who was actually driving the vehicle. The previously mentioned “California” rolling right turn above is the most common reason for individuals to receive a camera ticket. If you receive a camera ticket, make sure you read the ticket’s instructions and watch the video online of the alleged failure to stop. The Law Offices of Jason Newcombe are here to answer your questions and protect your record. Give us a call.